All of our original digital art is now for sale. Imagine your office and/or home decorated with this digital art. After capturing a photo we make them as colorful and sharp as possible by using the latest version of Adobe Photoshop and Lightroom. We also have many other artful technices to use to turn the photo into a digital work of ART by using: various types of brushes, grunge and edge overlays, etc. Many of our plug-ins assist in turning the photo into beautiful painting. We can size each photo to the size you need for framing. 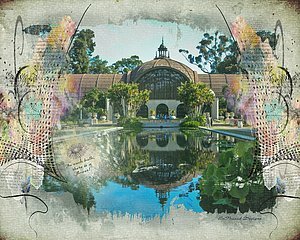 Each existing digital art photo in the examples are priced at $50.00 and are 300 dpi, ready for framing. Following is a link to our gallery for over 375 examples and purchase: "Click Here for Digital Art." Time permitting, we will be happy to supply your church with original graphics at no cost. You will need to give us a good lead time and good description of what you need. Description should include the idea or theme of the graphic and the size you need. Use our contact page for your input. You can see sample graphics on our "Gallery" tab. Look under "Digital Art - Christian". And, we make awesome graphics to "flower" your site. You will love our graphics. On the sites below, all the photos and graphics were made by EnThused Designs. We have been doing that since 1999. Please feel free to peruse the sites we have made as shown in blue on our "Clients Page." You will enjoy them! For years, we made websites but no longer continue to do that... just the photography or graphics.